The most significant places to see around Paro are the Dzongs and Monasteries and it’s important to understand the difference between the two. 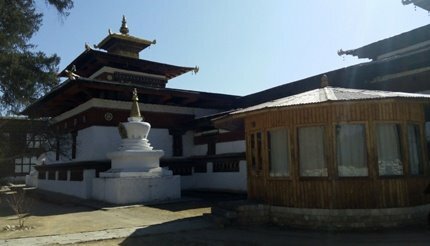 While a Dzong has official chambers and court of justice along with temple, a monastery is built for meditation and prayer only. It's possible to cover Paro in 2- 3 days but the atmospheric beauty, traditional buildings, swaying red rice fields and the small attractions around might as well inspire you to stay longer. 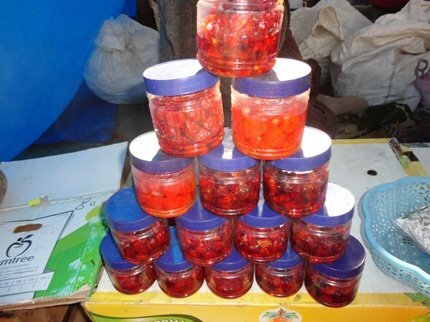 Paro itself is a small town located in the Paro Valley at an altitude of about 2,200m. It is also the capital of the district. 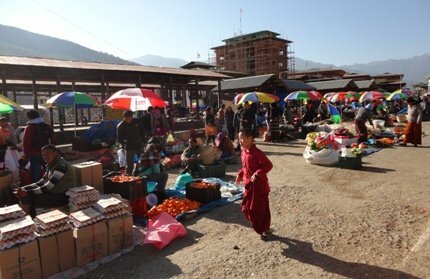 Paro and Thimphu are about 51 km apart and the cab will charge about 600 NU for the journey. From Wangdue to Paro the distance is 147 km and the taxi fare is 1488 NU. From trongsa to Paro the distance is 233 km and the taxi fare is 4088 NU. From Paro to Haa valley the distance is 65 km while the cab fare is 1060 NU. From Phobjika valley to Paro the distance is 166 km while the cab fare is 3078 NU and from Haa valley to Paro the distance is 65 km while the cab fare is 1060 NU. From Bumthang to Paro the distance is 312 km while the cab fare is 5000 NU while from Paro to Samdrup, the distance is 498 km and the full cab fare is 8056 NU. Arguably, the best tourist spot near Paro, the Taktsang is not for the faint hearted. What makes this Monastery different is that there is no way to access it apart from a steep mountainous hike. I stayed on the upper fringes on the Paro Town and it took me a good 20 minutes by taxi to reach the base camp for Taktsang Monastery. If you are staying in Paro Town, then it will take you 15 minutes more. From the base camp, you need to hike or take a pony ride. 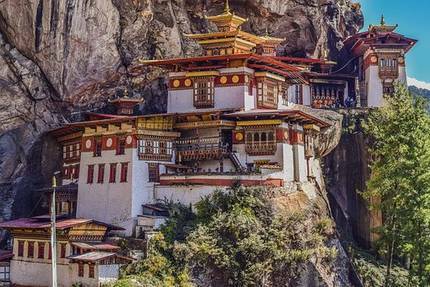 Read Taktsang Monastery to know about the journey to the monastery and what to expect. The 35-km driving stretch to Chele La from Paro is one of the most interesting rides you will be ever exposed to. 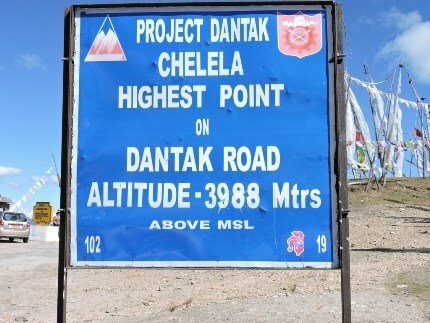 The Chelela Pass separates the consecutive valleys of Paro and HAA and it's considered to be the highest motorable pass (altitude 3988 meters) in the whole of Bhutan. If you are visiting Paro in the summers, spring or autumn then do not miss the spectacular ride through larch and spruce woods. In summers the woods will be full of wildflowers making the whole journey exquisitely beautiful. If the day is bright and clear, you will enjoy beautiful views of the HAA valley along with Mt Jomolhari (sacred mountain) and Jichu Drake. You can also consider hiking up to the Chelela pass especially if you are arriving in summer. There is a very popular hiking route that starts off at Kila Gompa Nunnery (on the cliffs below Chele La Pass). On this hiking route, you will find many retreat cottages and 7 small temples (all built into the cliff). The trail lets you walk through woods carpeted with rhodendrons and primula and other exotic flora before entering the ridge of Chelela. This is a medium intensity hike and the starting point (Kila Gompa) is 27 km from Paro. It will take you 30 minutes to hike downhill from Chelela to Kila Gompa and 50 minutes to hike up from Kila Gompa to Chelela. However, in winters and the monsoons… it's generally not advisable to travel to Chelela as the roads may be slippery with ice and water. Also, a lot of landslides happen along that area during monsoons which makes August and July avoidable for excursions to Chelela. A standard Taxi driver will charge around 1200 INR for showing you these 5 points around Paro. However, you can opt to see some of them on foot as the walk will be invigorating and blessed with magnificent views. I covered the Kyichu Lhakhang, Paro Dzong and National Museum (described below) on foot and thoroughly enjoyed the experience. This is Bhutan’s oldest monastery that is only 5km away from Paro Town. From my Hotel, kyichu-lhakhang was just 1.5km away and I saw it on a morning walk. The road to the monastery is gentle and doesn’t have a series of steep steps that characterize other monasteries in Bhutan. The complex is unremarkable but once you enter the spiritual aura of the place will move you. Elderly monks keep walking around spinning the many prayer wheels encircling the temples amidst gentle Buddhist chanting. There are two beautiful temples adjacent to each other; the 7th century one was built by King Songsten Gampo of Tibet. Later another magnificent 19th century monastery was built. The 19th century monastery was Built on the instructions of Ashi Kezang Choden - wife of the 3rd king of Bhutan and the advice of lama Khyentse Rinpoche who is also the teacher of Dalai lama. Photography is strictly prohibited inside but the resident monk Kinga Tshering who has been serving the monastery since the last 1 year was kind enough to share information about the history and culture of kyichu-lhakhang. The 19th century temple is dedicated to Jho Buddha of long life, red Tara and god of compassion (all wish fulfilling deities). The 7’th century monastery is a tribute to Rinpoche...The vanquisher of evil spirits and demons. Other deities in the monastery include the many armed god of compassion and rare antique statues of Padmasambhava. Thingsey Rinpoche the famous lama died in 1981 and was reborn in Nepal in 1984. Lama’ ashes are stored in 19th century Chorten where jewels and fragrant water is offered every day. Also on display is a photograph of Grey mustaq, the revered founder of Bhutan. He is as important to Bhutan as Columbus is to America. 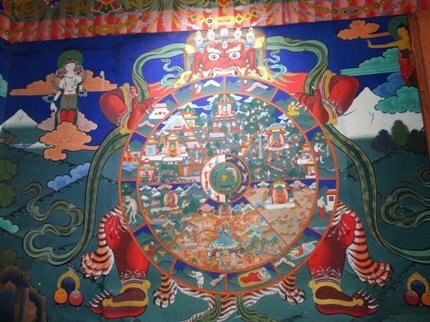 One of the paintings in the monastery depicted the episode of Second Buddha Padmasambhava born from a lotus as an effect of the prayers of many gods and goddesses. The monastery complex radiates a strange mystical aura augmented by the presence of an evergreen orange tree which bears fruit the whole year through. This is an excellent place for meditation and deep thinking. The Ta Dzong (National Museum of Paro) is situated about 1 km away from the Paro Dzong and is at an elevation of 2487 m above Paro town. The structure with the purpose of defending the dzong and protecting Bhutan’s cultural and religious identity. The building has an unusual shape (like a conch shell) and has 2.5 m thick walls. If you really want to know and understand the history of Bhutan, then the National Museum of Paro is a must visit. Shifting through its exhibits and looking at its neatly segregated array of artifacts will walk you through the transitions that Bhutan has been through. The museum underlines the 9 goals of Bhutan i.e. Psychological Wellbeing, Ecological diversity and Resilience, Health, Education, Culture, Living Standard, Time use and balance, Community Vitality, Good Governance. Once my tour of the museum was over, I walked down to the Paro Dzong and then back to the town (a good 4 km walk). I could see the Ugyen Pelri Palace in distant view. If you are interested in hiking then you can hike up your way to the Yuri Dzong from the museum. • Museum closes at 6pm in summers and 5pm in winters and the lunch break is from 1pm to 2pm. If you are an avid hiker then maybe you would like to attempt the trek from Khichu Lhakhang to Drugyel Dzog which is 10 km away as you will then be rewarded by magnificent views. However, for lesser souls, hiring a cab for the day is a good option as Drugyel Dzong is a part of the famous five points near Paro. Built by the Buddhist icon Zhabdrung Namgyal, the Drugyel is a point of strategic importance as its original purpose was to control the route leading to Tibet. In fact, the purpose of construction was to celebrate the victory of Bhutan over Tibetan invaders. 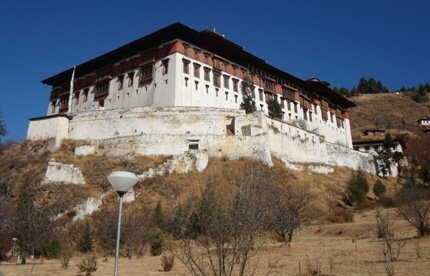 What interested me greatly was the false entrance of the Dzong that led any attackers or invaders into an enclosed courtyard where they would be easy prey for attack by Bhutanese soldiers. I learnt from a resident monk that the Dzong was destroyed by Fire and orders of its reconstruction came after the birth of K6 The Gyalsey in 2016. (would be king of Bhutan…Bhutanese number their kings like they call the present king K5). UNESCO Lists the Drugyel Dzong as one of the most beautiful World Heritage sites and the ruins are well preserved. If you look carefully, you can distinguish stone wall structures and fallen window frames. The building was built in Shabkor style with formidable masonry walls that allowed entrance from a single point. Hidden tunnels for army passage way and water fetching are present. Cylindrically shaped buildings named Chu Dzong are connected to each other by complex paths. However, I was unable to see all this personally as Dzong is under construction and its only possible to get an external view of it as of now. 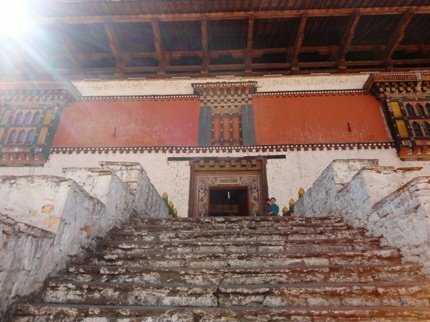 The Paro Dzong is only 1 km away from town though it has a steep flight of stairs leading to it. It is highly recommended that you take time to savor the walk as well as the picturesque ascent to the Dzong. The entry to the fortress like Dzong is by a suspension bridge overlooking the sparkling waters of Paro river. Once you start walking up you will not be able to put your camera away as the views compete for beauty. 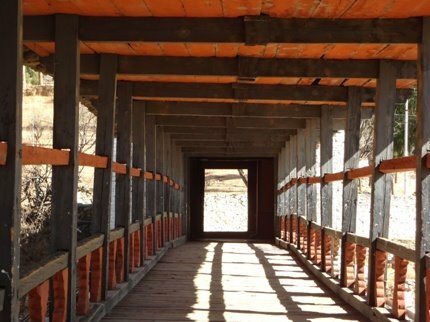 Bridge leading upto the Paro Dzong. the four Kings of the world and the Circle of Life. I met a helpful resident monk there who explained that the original construction started in 15th century as Hungrel Crag was dedicated to Lama Drung Drung Gyal who then built a smallish fortress here. 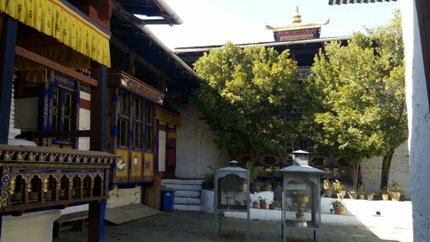 However in 17th century the dzong was dismantled and the huge existing structure comprising of Kungarwa, Monks' assembly hall, Sandalwood stupa, Temple of the Guru's Eight Manifistations, Chapel of the head lama, Chapel of God Amitavus, The Clear Crystal Shrine, Chapels of the Eleven-faced Avalokitesvara, Akshobhya, Temple of the Treasure Revealer along with Apartments of the King (Gyalpo'i Zimchung). If you happen to visit in April, do not miss the gorgeous Ishechu festsival that comprises of series of masked dances and Thangka displays along with the unique public display of 8 forms of Padmasambhava. 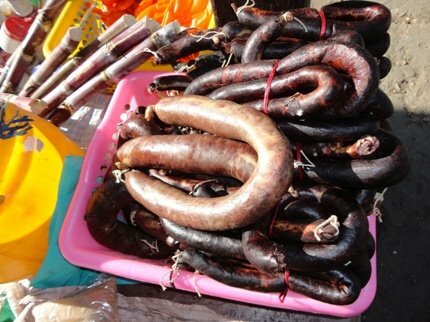 Seeing the vast array of indigenous local produce including red rice, cheese, chillies, huge brown eggs, dried sausages and interacting with the locals is a great experience. 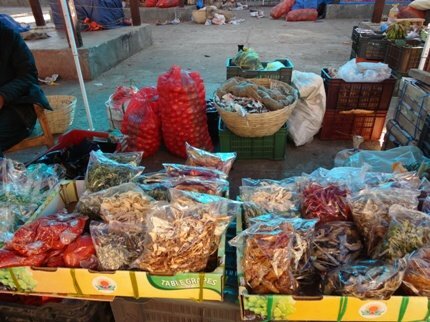 The market is open between 10 a.m. to 6 p.m. Friday to Monday. Local spices & condiments (good stuff to pick up as keepsakes). 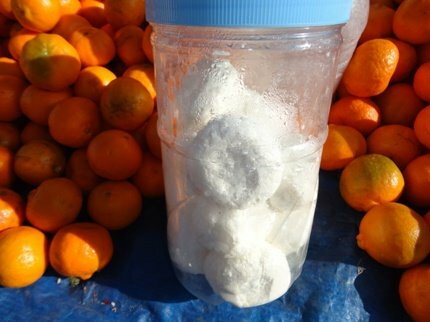 They are all meticulously packed and can be stored for months. A big stone paved circular area near the North East entrance to Paro, dancers perform at this point on important festivals and occasions. There is picturesque series of 6 Chortens lining up the path from Town to Paro Dzong and they are all encircled by Prayer wheels. Chortens are sacred structures that carry the ashes of renowned Buddhist religious figures. Hike up for 15 minutes from the south east of Paro and you can see the Pelri Goemba that is an ancient Nyingmapa inspired Chapel. Look down from the Paro museum of Dzong to get a good view of the Ugyen Pelri palace that was built by Tshering Penjor (Paro’s governor) for the Queen mother. You can choose to travel to Thimphu, HAA Valley, Punakha, Bumthang from Paro.